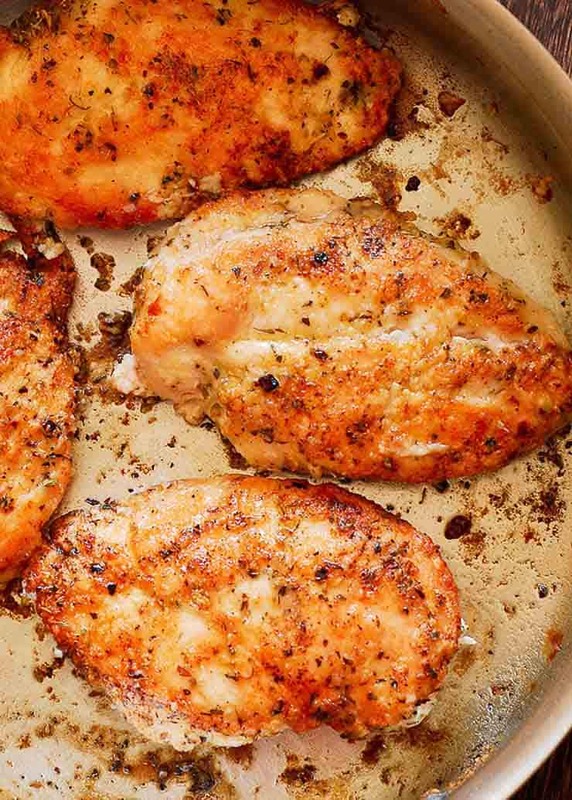 Easy Pan-Seared Chicken Breasts - What's In The Pan? 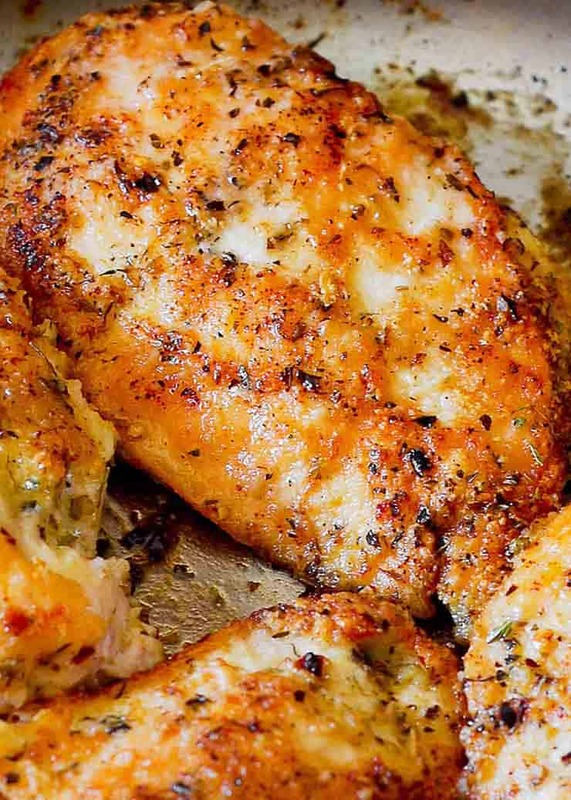 Easy Pan-Seared Chicken Breasts have a crunchy crust and lots of flavor from Italian seasoning! 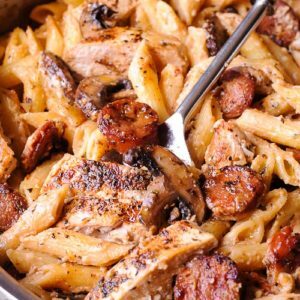 This easy chicken recipe turns out excellent every single time! Easy pan-seared chicken breasts is one of my favorite ways to make chicken. You pan fry chicken right in the skillet. So that you can enjoy crunchy crust and lots of flavor! It’s an excellent way to cook boneless and skinless chicken breasts when you are short on time. To make this pan seared chicken, make sure to use thin boneless skinless chicken breasts. You can easily dredge them in the flour mixture. Another selling point is since they are flatter, they retain the coating better. By the way, I also used thin chicken breasts in this Parmesan Crusted Chicken recipe. Besides, boneless chicken breasts are so easy to find! They are also low in fat and high in protein. So perfect! To dredge chicken breasts, you will use all purpose unbleached flour. By the way, flour is one of the best coatings for frying or searing chicken. And it always produces nice and smooth coating. How about whole wheat flour for dredging? Of course, you can use whole wheat flour, too. Whole wheat flour is very flavorful and will taste slightly different. Use rice flour to get a beautiful golden crust on your chicken. Other mild-flavored flours that also work well include: specialty gluten-free flour mixes, corn flour and potato starch flour. Or, if you are able to tolerate nut flours, almond flour works great for coating and pan searing chicken. It also gives it a beautiful color. I also have instructions on searing thick chicken breasts where I don’t use flour at all. 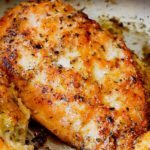 In fact, you can compare and see how different the process is when chicken is thicker: How to sear thick chicken breasts. First, paper towel dry the chicken. Next, in a large bowl, combine flour, sea salt, black pepper, garlic powder, onion powder and Italian seasoning. Immediately stir well to blend. Then, using a fork or tongs, coat the chicken breasts in the flour mixture and set aside. The reason why we want to dredge chicken in flour is simple! It’s because we want to make chicken’s surface attain a more attractive brown color. And we also want to get some crisp on the outside. Additionally, you can also coat the chicken by tossing it with the flour. Use either a plastic bag, a paper bag or a plastic container with a lid. Or, you can sprinkle the flour onto a plate. Then roll the chicken breasts around in it, while pressing it into the flour. This easy pan seared chicken recipe produces a lovely crisp coating. It’s not the least bit heavy. What you really taste is the chicken, not the coating. And that’s how it should be. The coating is just barely there to complement the food. First things first, you will heat 2 tablespoons of olive oil in a large skillet over medium-high heat. Once the skillet is hot, you will place flour coated chicken breasts in the skillet. Next you will sear chicken breasts them for 4 to 5 minutes on each side. They should turn golden brown in color on both sides. Finally, I recommend to turn them only once between cooking. And the total cooking time should not exceed 8-10 minutes. I recommend using a good quality stainless steel pan, such as this 12 inch pan that comes with a lid. Or, you can also pan sear chicken in a large cast iron skillet, such as this 12 inch Lodge Pro-Logic cast iron pan. Both hold heat incredibly well and are easy to cook with. I cooked most of the recipes on this site with one of these two skillets. 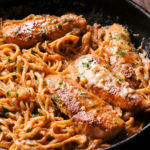 Easy Pan-Seared Chicken is easily prepared right in the skillet with a crunchy crust and lots of flavor from Italian seasoning. Paper towel dry the chicken. In a large bowl, combine flour, salt, black pepper, garlic powder, onion powder and Italian Seasoning. Stir well to blend. Using a fork or tongs, coat the chicken breasts in the flour mixture and set aside. Heat 2 tablespoons of olive oil in a large skillet over medium-high heat. Once the skillet is hot, place flour coated chicken breasts in the skillet and cook for 4 to 5 minutes on each side, until golden brown on both sides and cooked through, turning once between cooking, about 8-10 minutes. Remove chicken from pan and serve warm with pasta or vegetables. 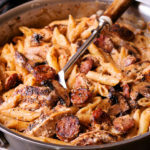 Our new favorite chicken recipes include this Cajun Chicken and Sausage Penne Pasta dish. 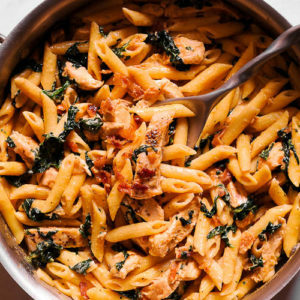 Additionally, we also like this amazing Chicken Spinach and Bacon Alfredo Pasta. 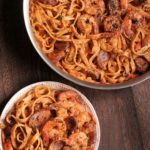 In fact both recipes are perfect for midweek dinners! 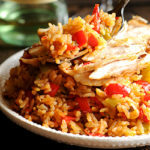 Excellent – will be a go-to quick and tasty chicken breast recipe from now on ! Tried this recipe tonight and it was yummy and juicy. Served the chicken sliced over Italian olive oil noodles. We will be making this on the regular for sure! Thank you for sharing. Really liked how delicious, fast and simple this was to make. I put this on a salad with some avo dressing. Hubs enjoyed it as well. Thank you! I really liked this recipe. I added lemon juice though because firstly I love be the flavour but I also wanted some extra juices to drizzle over the cooked chicken. Thank you Sarah! I’m a big fan of lemon flavor as well. There is a typo in the “Searing chicken breasts” section. Alright JACOB! Thanks for letting us all know how to spell!! I’m sure you have NEVER made an insignificant mistake in your life!! So…..are you giving the recipe a 1 star or the misspelling? Because the recipe looks amazing so who cares!!!! Yummy! Eatinh as I comment. Easy. Nice looking. Used butter and olive oil im pan. Was perfect! I also made a sauce with butter, onion, garlic , some flour and chicken stock with some boullion and Italian seasoning. Yummy on the chicken. Thank you Dod. Sauce sounds yummy too.